The Last Day At Work is a very poignant, title for one of the best Short Trips I have listened to yet. The story features the Doctor and Jamie, and is set in 1968. 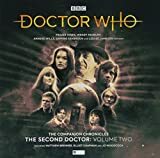 Apart from the synopsis above, I'll let you discover how the story unfolds as you listen to it, there is a simple joy in this second Doctor tale that should never be ruined, or the story will lack the emotional punch that it aims squarely at your jaw. I did guess as to the direction that new(ish) writer Harry Draper was taking the listener....however I didn't fully realise exactly how deep into the shows rich mythology he would delve, so much so to create a new mythology all of his own. Nicholas Briggs is on narration duties, and makes for a mighty fine second Doctor....although I did think that his version of Jamie was some way off of the mark. However this is a minor quibble, as the Short Trip range is always more about story telling as opposed to full cast audio plays. I really can't recommend The Last Day At Work enough, and with it being part of the Paul Spragg Short Trips Memorial Opportunity the story is FREE, and can be downloaded from Big Finish HERE. DID I MENTION THIS STORY IS FREE? GET DOWNLOADING PEOPLE!!!! What with Big Finish’s ever-accelerating expansion into new realms of the Doctor Who universe, from boxsets chronicling the exploits of underserved New Series allies to their ambitious work reviving axed spin-offs like Torchwood, it’s often all too easy to forget that the studio’s roots lie in offering classic incarnations of the titular Time Lord a bold new lease of life. How better to remind us of this noble goal, then, than by transporting us back to the 1960s with the latest Companion Chronicles boxset, showcasing Patrick Troughton’s tenure at the helm of the TARDIS in all its monochromatic, bowtie-donning and frequently base-sieging splendour? Had soon-to-be showrunner Chris Chibnall’s 2012 Eleventh Doctor odyssey “Dinosaurs on a Spaceship” aired in the Troughton era rather than the dying days of Matt Smith’s, then Julian Richards’ charming opening salvo offers perhaps the perfect approximation of how the story might’ve played out under such circumstances. Dropping the newly-regenerated Doctor, Ben and Polly within spitting distance of a castle populated by cybernetic dinosaurs, “Curate’s Egg” throws caution to the wind, embracing Doctor Who’s frequent flirtations with the fantasy genre through elements as unashamedly ridiculous as mind-swapping gizmos, talking T-Rexes as well as arguably the best canine-themed visual gag of the year so far. Will it all seem too far-fetched for some listeners? Quite possibly, although Anneke Wills and Elliot Chapman – working on double duties here, albeit with Ben only featuring in proceedings for 10-15 minutes at most – do a fine job of keeping events grounded with their heartfelt exchanges as Polly and underappreciated scientist Andrew Clarkson respectively, their joint irritation at society’s efforts to side-line them at every turn adding a welcome emotional core amidst all the prehistoric hi-jinks. Indeed, so brimming is “Egg” with potent concepts – not least the Doctor’s underlying efforts to regain his companions’ trust in the wake of his recent “renewal” – that this reviewer couldn’t help but wish at times that Richards had explored some of them in greater detail over the course of his jam-packed hour, for instance by saving one or two ideas for future scripts instead. Food for thought next time around, perhaps. Apologies if the experience of reading the last 55 words felt akin to learning a foreign language for the first time, but put simply, Infinity War might’ve just met its match in the eyes of Doctor Who fans worldwide with Volume 2’s sophomore instalment. Just as we’ve seen multiple Doctors cross paths in anniversary specials from “The Three Doctors” to Big Finish’s own The Light at the End in 2013, so too does the audio behemoth’s wide-ranging Who license allow them to bring together companions from differing eras of the show at times, and in this case it’s the turn of James McCrimmon to shine alongside one Leela of the Sevateem. In other words: cry havoc and let loose the dogs of war. Thankfully – not that this should come as any surprise given the levels of acclaim which both stars continue to court with their audio portrayals – neither Frazer Hines nor Louise Jameson disappoint, their hallowed characters’ clash of primal wits so ferociously unpredictable and regularly hilarious that you’ll soon wonder how it’s taken so damn long for this heavenly pairing to occur. That’s for the best too, since the core plot of “Waiter” leaves something to be desired in comparison, its rapid barrage of reality-warping setpieces and convoluted technobabble rendering the TARDIS team’s trip to a deeply sinister garden party even more overwhelming for the audience than it is for the Doctor as his present and future collide before his eyes. Scribe Rob Nisbet has his character drama down to a tee, then, but he’ll still need to work on balancing this with comprehensible plotting in order to craft the next Big Finish masterpiece. It’s worth noting from the outset that Volume 2’s penultimate chapter, John Pritchard’s “The Iron Maiden”, houses all the components of a great Doctor Who serial – intriguing temporal anachronisms by the dozen, an extremely sympathetic central supporting character with whose mind these anomalies predictably play havoc and quite possibly the finest companion of the Troughton years, Wendy Padbury’s Zoe Heriot, taking the initiative as our de facto protagonist this time around. Upon sitting through the credits one hour later, then, imagine this listener’s disbelief at only being left with the following inescapable question: just what went wrong here? Despite her touching struggle to endure the seemingly endless conflicts of 14th century France, all while realizing that the worst is yet to come thanks to the suspect arrival of First World War technology on the scene, Jo Woodcock’s fascinating prophet-of-sorts Marie is criminally underserved here, lacking much to do beyond trigger the plot with her mysterious visions and prompt Zoe’s occasional epiphanies as she gets to the bottom of the situation. Throw in the disappointing absence of any real suspense – in spite of the deadly weaponry in our heroes’ vicinity – as well as what should’ve been a hugely poignant denouement falling surprisingly flat due to our minimal emotional investment in the ensemble, and “Maiden” unfortunately ranks as the boxset’s weakest link by some distance. Volume 2, in stark contrast to prior Companion Chronicles collections, opts out of binding its four serials with any ongoing plot threads or recurring thematic beats, such that “Tactics of Defeat” isn’t nearly as burdened with tying up loose ends as The First Doctor Volume 2’s “The Plague of Dreams”, wherein Guy Adams faced the intimidating task of endowing the First Doctor with a more fitting send-off than his abrupt departure in “The Tenth Planet”. If the benefits of this procedural structural approach weren’t already obvious to Big Finish upon commissioning the set, then they’re downright unmissable here, with Tony Jones’ refreshingly understated quasi-season finale proving all the more satisfying as a result. Not dissimilar to “Curate’s Egg”, “Tactics” pairs Zoe with her supposed Foe from the Future – better known to us as UNIT captain Ruth Matheson. Why the change of moral allegiances on Ruth’s part? Is everything as it seems? Both fair questions, but you won’t find us spoiling the answers here; much of the piece’s appeal lies in the constant twists and turns which Ruth’s mission to recover plague-emitting extra-terrestrial technology from a decaying temple take, not least Zoe’s supposed oncoming demise at the vicious hands of unknown assailants. The latter plot element might appear unthinkable given our foreknowledge of events to come in “The War Games”, yet we’re also well aware by now that “time can be re-written”, and indeed future Doctor Who scribes should keep in mind Pritchard’s tense work here as a prime example of how to put gripping new spins on the well-worn paradox-driven story format. Come for Daphne Ashbrook’s still-endearing work as the constantly resourceful, inspiringly courageous Ruth; stay for one of the more innovative scripts that we’ve seen enter classic Who’s audio pantheon for quite some time. How much you’ll get out of Volume 2 depends largely on what you expect from Big Finish’s Second Doctor productions – if you’re looking for authentic reprisals of the Troughton era’s unashamedly outrageous jaunts into fantasy territory or surreal mind-trips into worlds hell bent on distorting their visitors’ perceptions, then the fifth Companion Chronicles boxset since the range ceased its monthly output will fall right up your alley. If, however, you’re hoping to see the scribes involved push narrative / creative boundaries given their lack of 1960s budgetary limitations, then barring the basic set-up of “Curate’s” and the brilliant “Tactics” in its entirety, the end product mightn’t offer quite as much bang for your buck. It's out, and it's about time. Some five years after its initial release, The Enemy of the World is once again released this month, this time bursting with the features we've come to expect from a BBC Doctor Who DVD and that were notably absent from 2013. Indeed, even the DVD blurb acknowledges this: "Originally rush released shortly after its recovery, there was little time to complete the extensive Special Features typical of archive Doctor Who releases". Well, quite! So what do we get in what many would say is the "proper" release? Commentary: check. Production notes: check. Photo Gallery: check. An exhaustive making-of: check! The two-disc release also includes an interview with the man behind the rediscovery of this story, Phil Morris, a brief item on the restoration work undertaken in 2013, a tribute to the late Deborah Watling, the Jon Pertwee introduction to the then only existing episode 3 from The Troughton Years, and the original trailer from 1967 that followed The Ice Warriors. You even get a reversible cover so it can happily sit alongside the rest of your DVD collection if you prefer to maintain that consistent look and feel. However, one thing that certainly isn't consistent is the disc's opening menu! If you've been watching a number of DVDs recently like I have, the absence of the 'traditional' Davison opening accompanying the TARDIS 'arrival' into the main menu is quite a jarring shock, with the sequence being dispensed with in favour of a brief snippet of the Troughton titles leading straight to the menu. I guess I'll get used to it - at least the familiar "roundels" menu has survived! For the episodes themselves, the DVD boasts of further remastering with modern techniques by Peter Crocker and MArk Ayres - how much of an improvement in picture quality to the previous release I'm not so sure about, but the story looks and sounds very clean, and possibly as pristine as it'll ever be (and a definite improvement to the 480 line i-Tunes cash-in back in 2013...). I won't dwell over the story itself - after all if you're reading a review then you're probably familiar with the plot(!) - but it is one of those stories that features the change of direction halfway through that transforms the story into something else rather unexpected that I always like in drama. With only episode three as a visual guide for literally decades I hadn't appreciated this change of direction, and it is still a delight to savour now - it's probably no coincidence that the director, Barry Letts, becomes producer of an era full of such twists and turns. The complete serial also allows us to enjoy the characters in all their glory, and more to the point being able to watch the performance of Patrick Troughton in his dual role as hero and villain. I must admit that it still feels like a novelty being able to watch and appreciate the full story, and leaves me eager for more (something that animations can only partially sate!). But seeing Troughton smoking a cigar in episode five as though in competion with Roger Delgado in The Mind of Evil still feels out of place, even though it is of course Salamander puffing away, not the Doctor. How the perception of that enemy of the world's health has changed! The accompanying production notes provide the usual behind-the-scenes essentials, dates, figures, the development of the story from script to screen, changes to planned dialogue, action, etc., plus of course detail of the cast and crew and related observations. Insights include how several inserts made their way into later stories, how the slick action sequences in episode one were more fraught in production with both a hovercraft mishap and the helicopter very nearly following suit. During episode two it is revealed that there is a mysterious scene included featuring the Doctor and Kent that doesn't appear in the production schedules. And in episode five it is revealed how some of the more excessive blood and violence in the script were restrained in production. Though the production of the story can of course now be digested through reading Volume 11 of The Complete History, here the notes are more practical in illustrating what's currently appearing on screen - for example, In episode four, a practical example of the way in which those recording the programme worried less about the edges of the frame owing to on-screen visibility of the time is illustrated. The commentary for the story is initially taken up with a lively discussion between Frazer Hines and Mary Peach, joined by Gordon Faith for the next couple of episodes. All change for episode four with Milton Johns and Sylvia James taking up observational duty, before returning to the original duo for the finale. Discussions across the episodes included acting with helicopters, working with Patrick Troughton, actor-come-director Barry Letts, and the delightful Debbie Watling (of course! ), acting in the confines of small studios and limited sets, plus Sylvia's explanation of how the crew approached the creation of 2018, some 50 years ahead of time. The commentary was moderated by Simon Harries, who had big shoes to step into following the mighty moderator extraordinaire Toby Hadoke; however he was more than capable of keeping the conversations going and keeping Frazer in check! The main feature on the second disc is Treasures Lost And Found. Unlike the more usual more straightforward fact-based making-ofs, here Toby Hadoke takes us on a "treasure hunt" for new information on the story in his indomitable style, uncovering "clues" along the way in a similar vein to Looking for Peter on The Sensorites - so it isn't surprising that his accomplice on this mission is researcher Richard Bignell! Along the way Toby (possibly) drank his way through innumerable relaxing teas conversing informally with Mary Peach, Sylvia James, David Troughton, Frazer Hines and Sarah Lisemore, plus several inserts on the making of the story from a 2008 interview with Barry Letts and also a 2011 interview with Deborah Watling. The informal approach to the documentary meant that Toby took time to chat to his interviewees about more than just their Enemy-specific memories. Mary's extensive career was discussed, including what occured when she met Marilyn Munroe, and David reflected on life with the Doctor and his father's views of acting in theatre - which also highlighted the perceived nepotism of the time with his cameo as a guard in the story, not to mention Frazer's brother Ian, Barry Letts' nephew Andrew Staines and finally production assistant come influential producer Martin Lisemore's wife Sarah, whose interview at the end of the programme turns into its most poignant moment as the treasure is finally revealed. I did have a couple of niggly issues with the presentation, though: the archive interview of Barry Letts was interspersed with shots of Toby and Richard watching the footage on a laptop, which I found both disjointing and a distraction to hearing what Barry had to say. The other was the "pop-up" message gimmick, which reminded me more of Top Gear style antics (something perhaps not lost on Toby? grin). These were only minor quibbles though, overall the feature is highly entertaining, ably guided by Toby throughout. Restoring Doctor Who is an accompanying piece which documented some of the process in restoring the story from its original off-the-shelf condition to what we can watch today. Remembering Deborah Watling is a tribute to the actress whose bubbly presence is sadly missed. Featuring Louise Jameson, Colin Baker, Sylvia James, Anneke Wills, and Frazer Hines, Debbie's life and career is followed through the memories of her sister Nicky and brother Giles, with everybody involved reminiscing on her wicked sense of humour, practical jokes, and of course her healthy scream! The package is rounded off with the brief introduction to the then single remaining episode by Jon Pertwee from The Troughton Years, a trailer for the story from 1967, and the usual photo gallery, plus PDF materials. So is the special edition worth buying? It does of course rather depend on whether you are interested in the extra features. If you're only interested in the story then, with this version released, if you haven't already purchased it you might well see the original 2013 version drop further in price in the coming months. If you're only after a commentary then an alternative, unoffiicial release from Fantom Films may be a cheaper option (though there isn't much difference in cost between that and this entire DVD online at present!). However, if you haven't bought Enemy before then I would certainly recommend this as the version to get. It's just a shame it wasn't presented this way in the first place! Hmm, with all the extensive recovery articles on this release, what's left for the special edition of The Web of Fear ... ?!! The production discussion places the setting of the story as 2017, but a newspaper clipping seen in episode five shows "last year's date" of 26th August 2017, indicating it is actually set in 2018 after all. I might well be the only person who will laugh out loud at Richard's ringtone! A notable absence on the DVD commentary is of course the wonderful Debbie Watling, who had left us by the time this package was put together. All is not lost, however, as she can be heard on the alternative commentary from Fantom Films (and you can also get your Toby fix as Master of Ceremonies too!). The CD is still available from Amazon etc. Wendy Padbury (Zoe Heriot/Narrator), Frazer Hines (Jamie McCrimmon/The Doctor), Judith Roddy (Commander Lorne), Adam Newington (Twenty), Don McCorkindale (Porthintus), Richenda Carey (Professor Blavatsky). The Wreck of the World is a rare case of a Doctor Who episode title both poetic and literal. "The World" is the name of a long lost colony ship, a huge vessel sent out from a dying Earth like a message in a bottle. But its wreck has now been found, it’s crumbling metal bones creaking and shifting in protest as human feet step upon it for the first time in thousands of years. And naturally, one of the first things encountered by the expedition blunt and pragmatic Commander Lorne leads to the World is a funny little crumpled man, a Scotsman and a petite genius in a silvery catsuit. The mutual suspicions that are the bread and butter of many Part Ones are present and correct here, but done with unusual charm. In particular, the expedition’s resident muscle, Porthintus, is a fun mish-mash of a Kroton, a Klingon, and the archetypical dictionary-swallowing NCO. The double act that emerges between him and Jamie lends an extra spark to the two groups teaming up, as they alternate between trying to beat the hell out of each other (Porthintus doing a little less ‘trying’ and a little more ‘beating’) and a jovial bond between soldiers. In parallel, Zoe teams up with her own opposite number, Twenty, though this is a bit less successful as it hinges on them both being ‘processed’ humans with artificially expanded intelligences and limited emotional range – something perhaps briefly mentioned about Zoe on TV but is depicted here into as essential an element of her character as being Vulcan is to Star Trek’s Spock. Needless to say, there’s more to worry about than whether Lorne and company are pirates or genuine in their desire to rescue the artefacts of thousands of years of ancient Earth, from ancient Babylonian stones to early 20th century steam trains, and bring them to museums. Soon enough there’s an army of zombies to contend with, as the mysteriously undead occupants of the long broken down cryogenic chambers emerge by the hundred and swarm to overcome our heroes. A keen sense of menace and claustrophobia hangs over the whole story, and scenes of Porthintus, Jamie and Zoe making desperate scrambles through pipes while the former colonists close in, or of games of hide and seek (or hunt the needle) among the shadows and relics of the museum decks evoke the likes of Aliens and Pandorum. Although, like other Early Adventures, we get narration it’s probably the least unintrusive yet, simply fading into the background for the most part. It takes a little while for Wendy Padbury to warm up to sounding like her four decades younger self, but by the second episode it’s hard to notice any difference and if Zoe seems a little sterner and more remote that’s largely down to a script that emphasizes that aspect of her character above all else. Frazer Hines’ hit-and-miss Second Doctor is sadly back to mostly missing the mark, though that’s largely down to a script that maintains such a high pace throughout that his Doctor doesn’t get as much room for the wit or character moments that Hines excels at. In compensation, it’s a very good story for Jamie, who really shines here, both in the script and in Hines' good humoured performance. Plus, it has a sweet and melancholic maintenance droid that, with shades of D84 in The Robots of Death, will leave you a bit sad when she doesn’t hop aboard the TARDIS at the end. All in all, The Wreck of the World is a fine, tense, survival thriller which excels in the sense of atmosphere it creates about the dying World. If some of the cast feel like an alternate take on well established characters, exploring roads largely untaken on screen, then it only distracts a little from an exciting entry in the Early Adventures series which matches the basics of the typical Troughton tale with the scares of a more modern horror film.